I have been waiting and longing for this app. In August last year I heard they were working on an app. I was at a seminar on February 5 at my local genealogy society where Niklas Hertzman were speaking, (he works at ArkivDigital), and he said the app was at Apple for approvement. 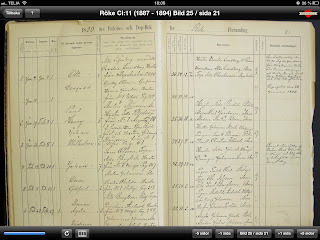 ArkivDigital is a company who takes pictures (in color) of the Swedish churchbooks and some other historical records and publish them online (and CD) and it is an ongoing project. 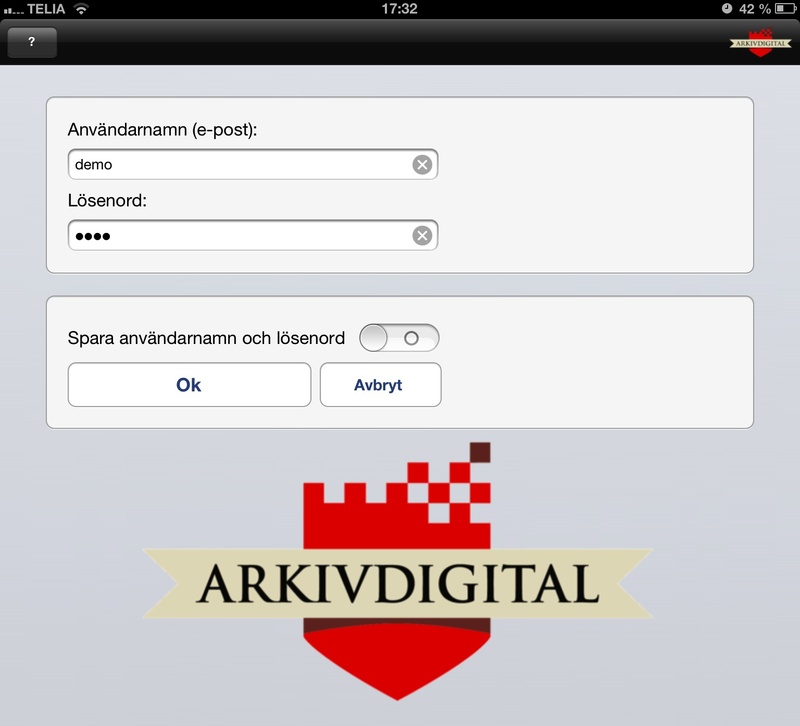 You need a subscription to be able to log in and you can buy subscriptions from one week up to two years at a time. If you have been using thier program AD Online on a computer you will be recognize the functions on the iPad. First thing you need to do is to download the app from Apple app store. 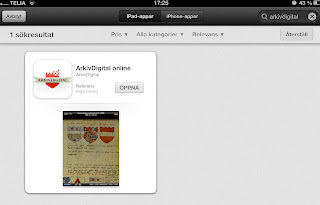 Do a search on “arkivdigital” and you will find it. It is free to download. 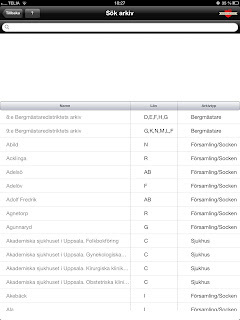 When you login you will see along list of what is available. 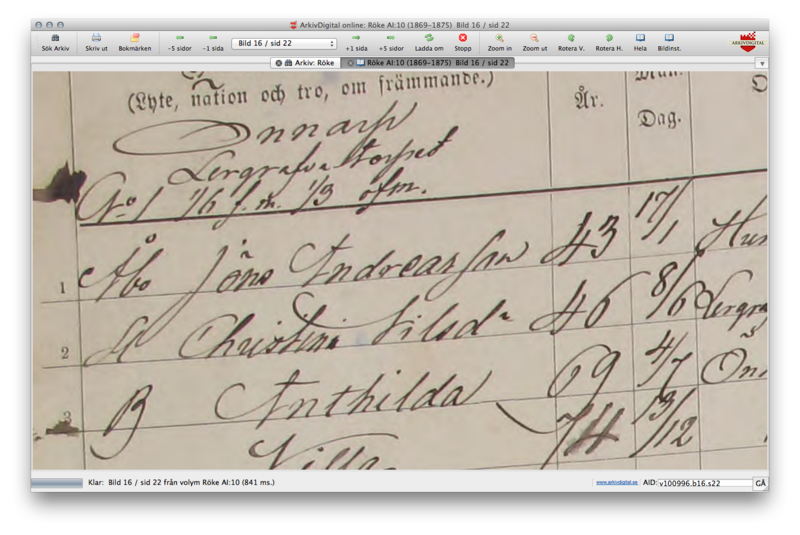 With the demouser you can see the names of the parishes and other archives that are available but you wont be able to see the actual pictures, unless you do a search on Röke or Älvsbacka. 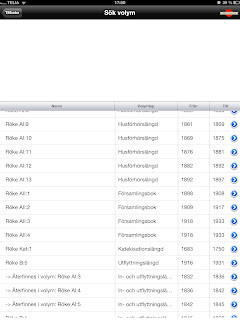 I click on the little blue arrow to the right and then I get a list of what records are available for Röke. 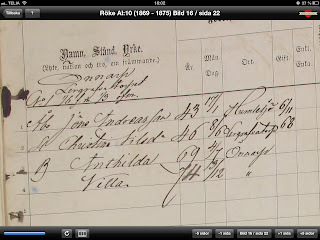 To start with, for example there are Household rolls (Husförhörslängder), birth-and baptismbooks (Födelse-och dopbok), banns-and marriagebooks (Lysning-och vigselbok) and Death-and burial books (Död-och begravningsbok) among others. Lets try. 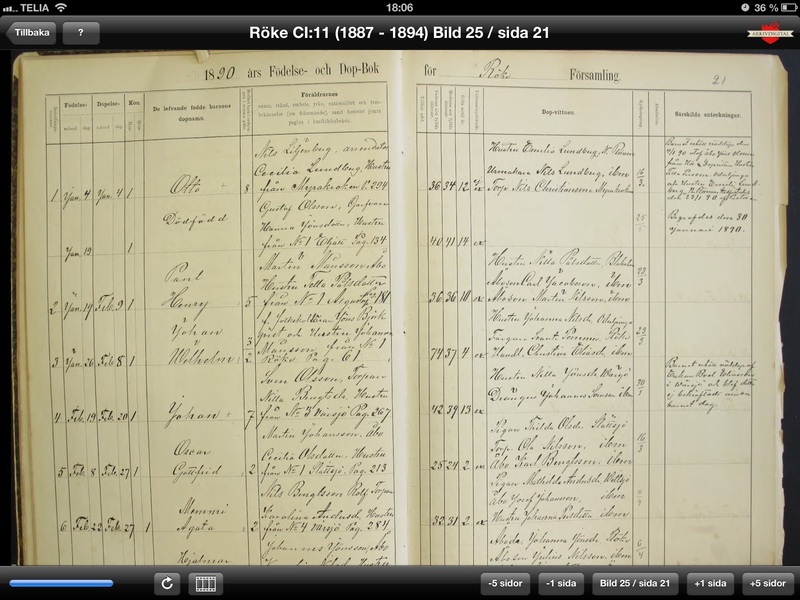 I want to check out the household roll covering 1869 – 1875. I click on the little blue arrow to the right and the picture starts to load. 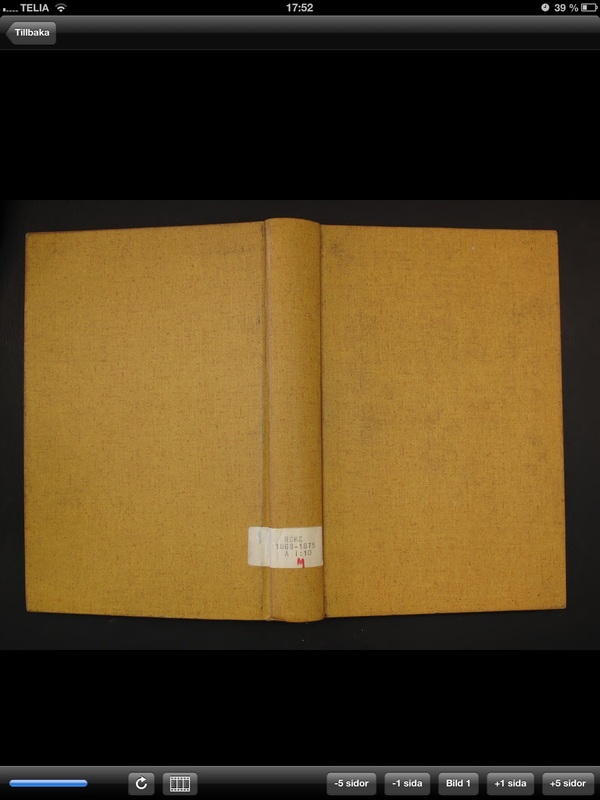 Picture one is a picture of the actual book. In the bottom to the right I have a five buttons. If you know what page you are looking for, click on the icon for current page and you will get the iPad typical scroll wheel and you use it to scroll to the page you want to go to. If you want to quickly browse pages close to the one you are at you click the icon looking like a piece of film. 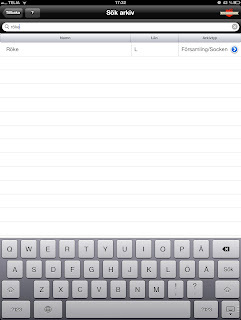 When the page is done loading, you are able to zoom in (and out) using the usually iPad two finger “pinching grip”. 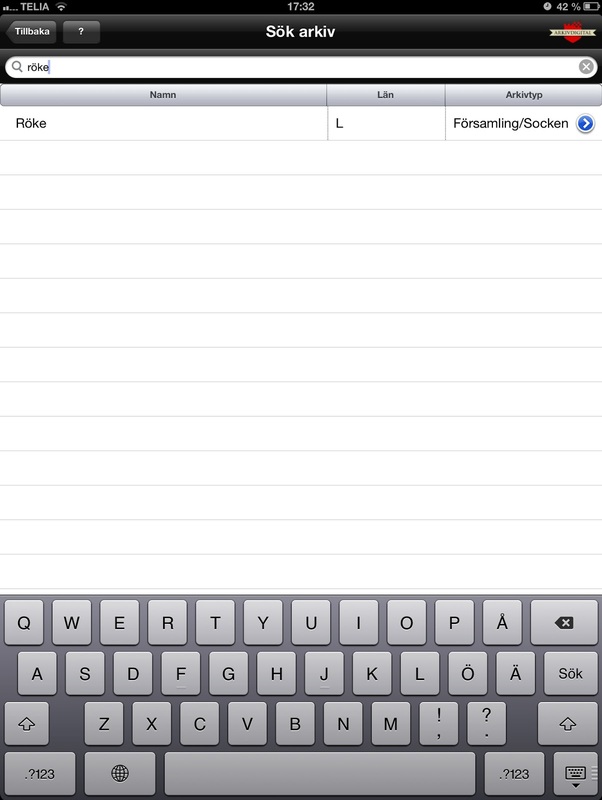 If you flip your iPad you will also get a nice view in the horizontial mode. This is what this page look like on my mac using the AD online program. In the bottom to the left is a blue bar, showing how much of the page that is loaded. When you go to a page you will first see a low resolution page and as soon and the page had loaded you will see it as a high resolution. 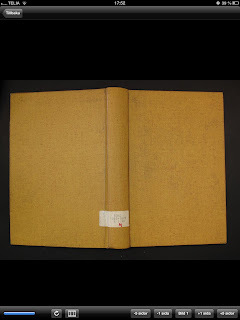 Here loading is in progress and now we are looking at a birth-and baptismbook. It takes just a moment and the picture is in high resolution. How fast it load is ofcourse depening on the WIFI. My experience is that for me, it is fast enough. 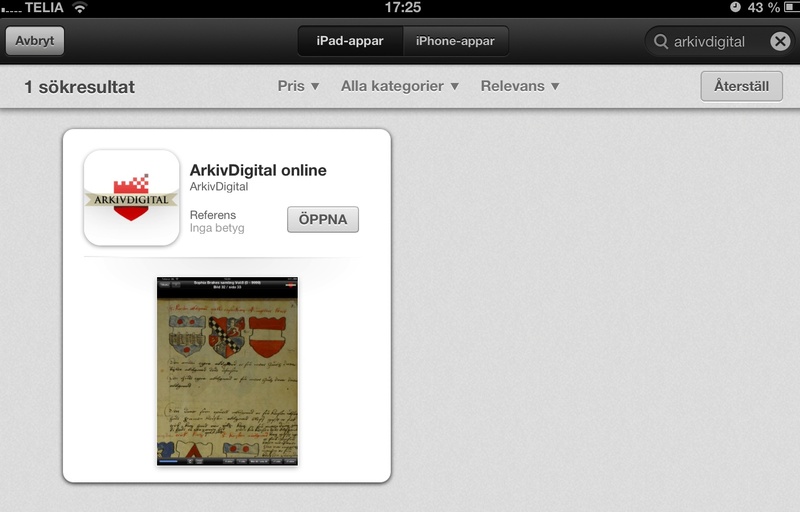 For me, doing genealogy in Sweden, already having a subscription at ArkivDigital this app is great. 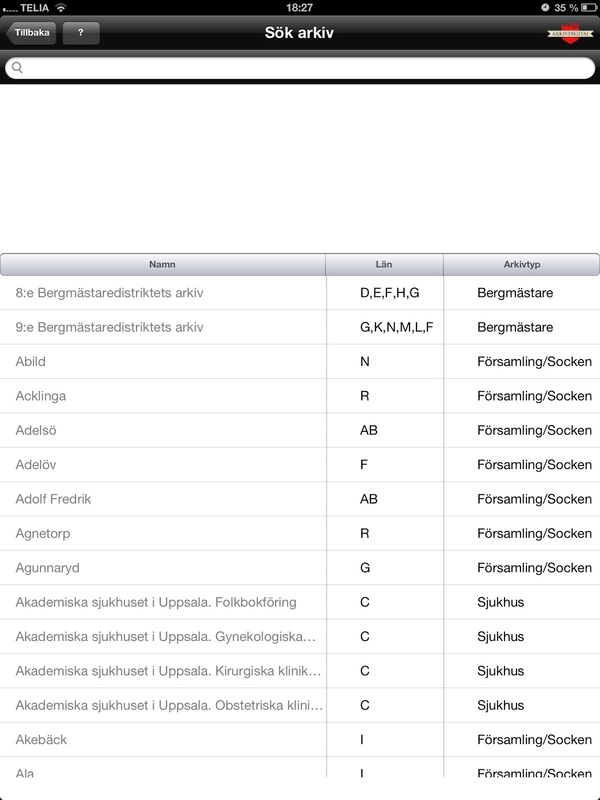 Now I can feel totally free and mobile and able to check up things with only bringing my iPad. This app has been on my wishlist for a long time. 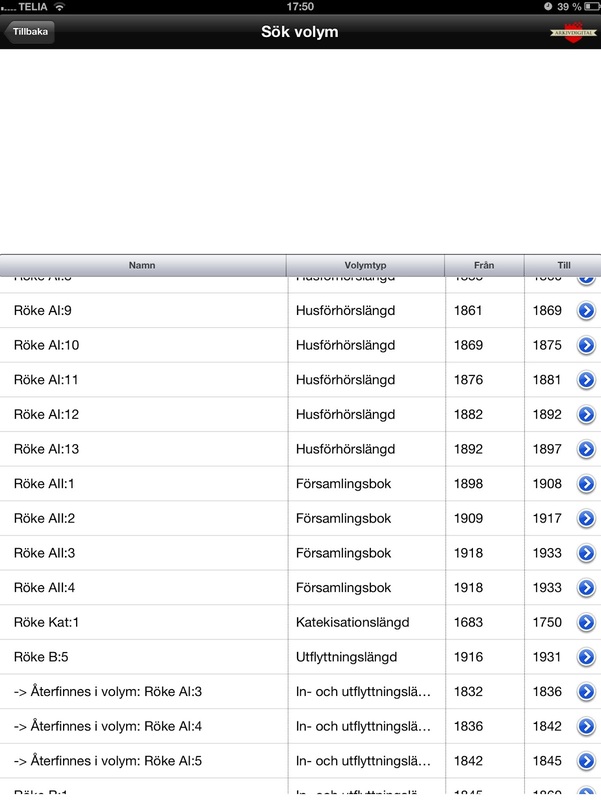 I would not start to do all my research on my iPad on a daily basis but just to be able to do a quick lookup is great. 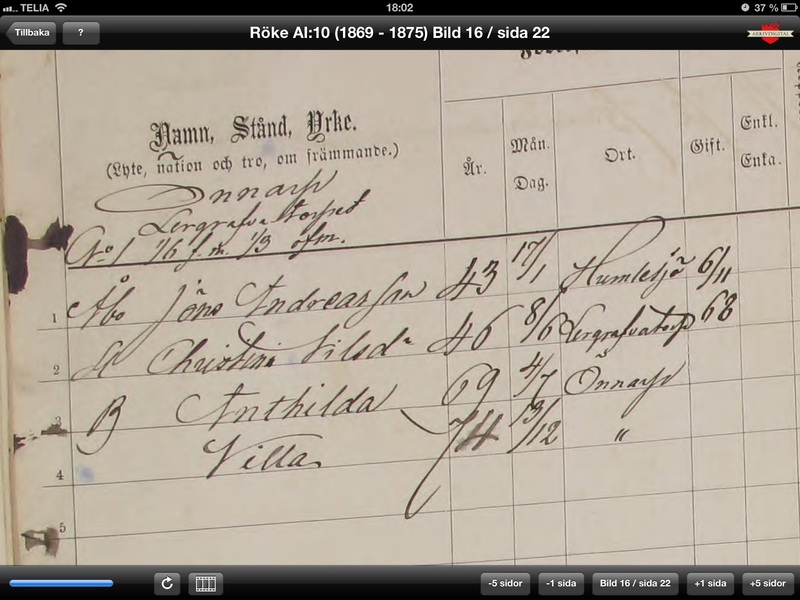 I dont know if there is an English language version, but I think that even if you are not from Sweden but are into Swedish genealogy you will learn the basic terms quite quick. 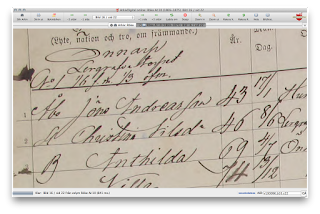 I look into Estonian archives at times and I have a little cheatsheet with with Estonian – Swedish translation next to me, helps a lot. 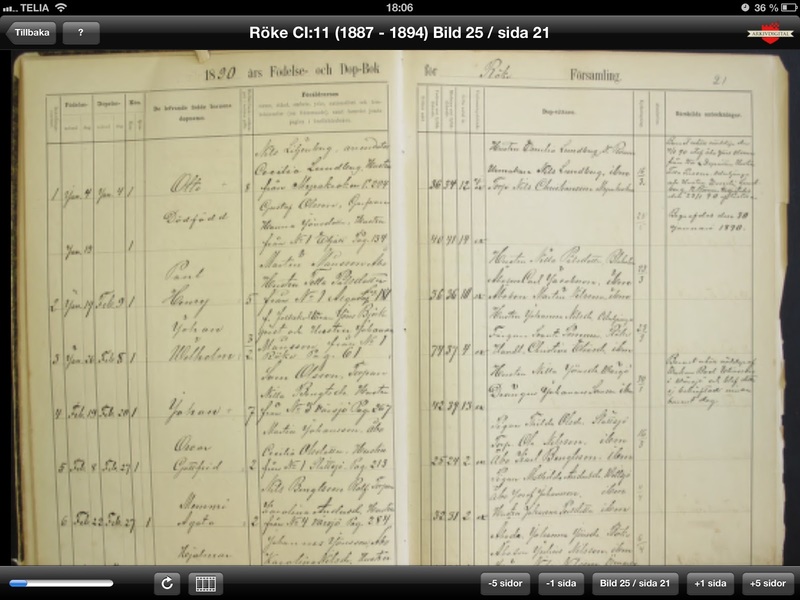 Check out ArkivDigital website for more information about what records are available. It is a treasure. I have had the app for a couple of days now and I really like how you are able to zoom in and take a really close look. You can do the same zooming on a computer but it is the feeling of being able to take up the iPad and take a close look and not needing to lean half over your desk. Another cool thing was at work where I at one of our coffebreaks took my iPad to the cafeteria and showed a couple of old records to my colleges. And as long as I have WIFI I never need to worry about finding anything to read before I go to sleep. Summary: Great app. What I miss in this version is the ability to save a bookmark, I use that all the time on my computer. I also miss the possibility to do a “copy source” which is in the computer version as well but this is really minor wishes and to me most important that the app has arrived.